I'm happy to share with you February's stash quilt pattern. Just in the nick of time! The layout is much different than what I had anticipated when I first started this quilt. That happens sometimes, and that's ok. I really like this happy little accident! 12 10" squares...either use layer cake pieces or yardage from your stash. (if you are using yardage, you will need just under a yard of fabric) I used 12 different prints. Cut the background fabric into 16 2.5" x wof (width of fabric) strips. If using yardage for the colors, cut 12 10" squares. Follow the instructions here to assemble the 12 blocks. Then, cut each block into quarters. Each piece will be 6.25" square. It's ok, but it definitely lacked pizazz. Not the vision I had at all. Sew the blocks together into rows. Sew the rows together to make a quilt top. Finished quilt top size is 35" x 47". If you try this pattern, I'd love to see it! In other news....Cheryl is here for the week to visit. Woo-hoo! We've been playing fabric already. Imagine that. :) And she gave this quilt it's great name. Thanks Cheryl! 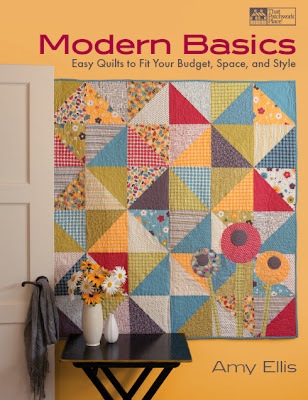 I plan on picking a winner for Amy's Modern Basics book sometime tomorrow. I'm so happy to be a part of Amy's Modern Basics blog tour today. Congratulations, Amy, on a beautiful book! The patterns in this book are straightforward and easy to follow. Perfect for a beginner but fun and flexible for a more advanced quilter. I love the quilt on the cover! I also completely LOVED this image in the front of the book. 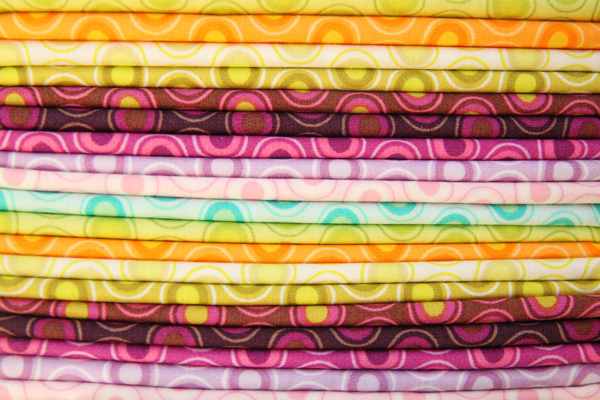 There is something so pleasing about a pretty stack of quilts! This is the million dollar question! I always tend to work in an assembly line which I think helps. But mostly I stopped and started a LOT! My most productive hours were (and still are), 8-midnight after the kids went to bed. During the day I would prep and cut fabric, and pin pieces so that I could systematically sew, and sew, and sew in the evenings. My husband and kids were all very supportive and excited for the book, and helped out with extra chores around the house and dinner preparations. While challenging, I think sewing at the kitchen table helped too - I am always right in the middle of the house and all that is happening with the kids, and can quickly get involved as I'm needed. That said, by the time my deadline rolled around I was very sick with a sinus infection and needed a month to purge all the clutter that had accumulated around the house while I was focused on my quilts and writing the patterns. I've learned that I have to let somethings go around the house in order for other things to get done, just not my kids! I'm okay with that as long as I can get back to it in a timely manner - otherwise the clutter drives me crazy! Make sure to stop at any or all of the stops on the blog tour for a chance to win your very own copy of Modern Basics! Amy will be giving away a copy of her new book to one commenter on this post. Please, only one comment per person. I'll announce the winner sometime next week. My long division quilt is complete! You can find the tutorial here. This was my first time designing a quilt with a values approach, and I think I will be exploring this method further. It's quite fun! I stitched a simple swirl all over in light grey thread. It blended with most fabrics well. That's about all you can ask for, especially in a quilt like this with so many colors and values. I tried out a new labeling approach. I used a little fusible web to this make it. It's ok, but I think I'm ready to graduate to "real" labels. Labels that someone else makes. Or else the labeling rarely gets done. I whipped up this angry bird for my little guy that will be turning 8 this week. It was all my brother's idea to make it. Since my brother has been kind enough to shovel my driveway 3 times in the last day (we got 14" of fresh snow), it was the least I could do to help him out. Sewing in exchange for shoveling??? Um, twist my arm! My little guy loves it. 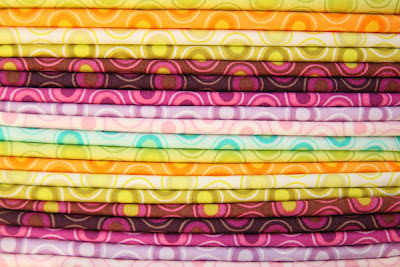 I recently had the chance to play with some of Pat Bravo's fabrics....fat quarters from the Oval Elements collection. This fabric is amazingly soft and the colors are vibrant and wonderful! I'm trying out a twist on one of my previous patterns, and I'm loving it so far. Pat is generously giving away 2 fat quarter bundles to two of my readers. (One fat quarter pack to each reader.) If you would like to win a fat quarter bundle, leave a comment on this post. Only one comment per person, please. I'll pick a winner sometime on Wednesday, February 16. I am making 9 patches out of 1'' cut squares. I'm not sure why. I'll be the first to admit that it's ridiculous. Each block will finish at 1.5". This mini quilt came all the way from England. Anne, who was my round 2 scrap challenge contestant, offered to play with my scraps in return. This is what she made for me. I LOVE it! It's currently hanging on my craft room wall and I smile every time I see it. Thank you, Anne! It's time to open up the scrap challenge for round 3! Here's how the scrap challenge works. One selected reader will send me a small bag of scraps. I will use the scraps, plus additional fabrics of my choice, to make a mini quilt. The mini quilt will be sent back to the scrap sender. I absolutely love this challenge because it gives me a chance to play with fabrics that I may not choose on my own. If you would like to be entered in the draw, leave me a comment on this post. If you have any suggestions of what you would like to see, you can feel free to add them in the comment. I will chose the winner randomly this time. 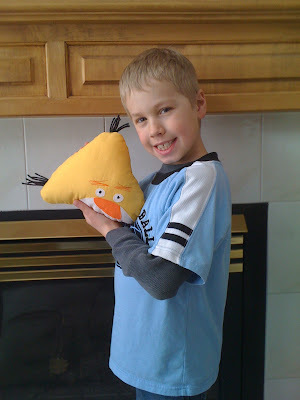 You can read about how the scrap challenge series first started here. The results of the first round are here. And the results of the second round are here. what's wrong with adding yet ANOTHER work in progress (or two) to the list? We made a stop at IKEA. We did some playing with fabric and yarn. We did some sock knitting. (And some frogging and re-knitting.) Tara did some free motion quilting on the Juki. I started 2 new quilts. (Why start only one?) We visited my favorite yarn shop and my favorite quilt shop. At the yarn shop we found a few things to purchase (of course) and in the middle of our transaction, Pam (the wonderful yarn store lady) excitedly remembered that someone was purging their fabric stash and told us to go take a look. (She knows that I'm a quilter.) I was skeptical that we would find anything good, but how wrong was I? We found lots of vintage silks. And some velvets. And linen. Some woven cottons and a few batik pieces. Most of the pieces were once clothing pieces. There was a wonderful variety of colors and prints. We left with a bag and a box full of fabric. Full of FREE fabric. :) It was a fabulous find. The fabric find led to some crazy quilting experimentation. The plan was to make a few squares to turn into pillows, but I switched from pillows to a quilt in no time flat. I think I neglected to tell Tara, which was very funny. But making quilts is what I do. Here are the first two blocks. I rather like them a lot. The bird piece on the right was part of our find as well and I think that it will make a wonderful (funky) addition to the crazy quilt. The piece on the left is my very favorite of the whole lot. It's is a GREAT red polka dot. I wish I had yards and yards.